Denham, UK, 2017-Apr-02 — /Travel PR News/ — InterContinental Hotels Group (IHG®) and Australian boutique hotel developer Pro-invest Group are championing smarter travel for everyone by unveiling plans to establish a $60 million Holiday Inn Express in the centre of Queenstown. The innovative 227-room select service hotel will be value rich and cater to self-sufficient travellers by providing a ‘little bit of nice’ when and where it’s needed most. That means frictionless service, faster check-in, better breakfast, restful night’s sleep, and everything guests need for a great stay, all within arm’s reach. 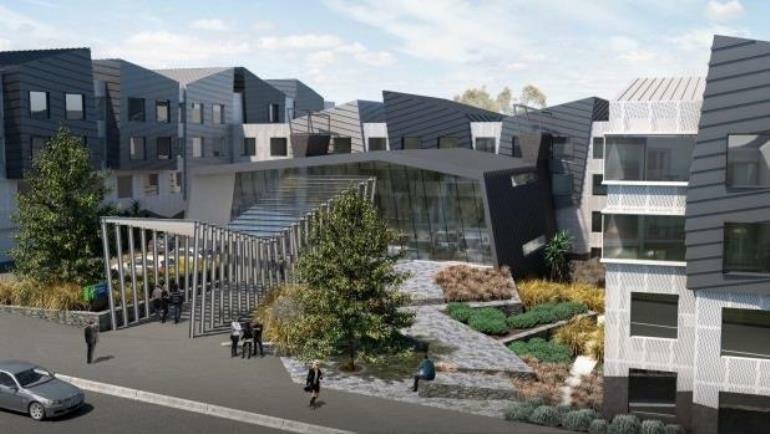 Designed by acclaimed Queenstown architect Preston Stevens of McAuliffe Stevens, the hotel will combine various abstract elements that are representative of the resort’s landscape history. “The underlying concept of referencing the landscape will be instrumental in achieving a design that’s a positive fit with the immediate urban environment and wider natural landscape,” Stevens added. The hotel will feature a fitness centre, meeting and laundry facilities, and the ‘Great Room’ with a complimentary guest breakfast buffet and a grab-and-go-style market pantry. Construction is expected to begin later in 2017, generating more than 750 jobs. With an anticipated opening date as early as 2018, Holiday Inn Express® Queenstown will inject millions of dollars into the local economy via visitor nights, tourist spend, and sourcing of food and beverage from the local market. This is the second Holiday Inn Express branded hotel slated for New Zealand, with IHG announcing the signing of Holiday Inn Express Christchurch in 2016, due to open in 2018. IHG franchises, leases, manages or owns nearly 5,200 hotels and 770,000 guest rooms in almost 100 countries, with nearly 1,500 hotels in its development pipeline. IHG also manages IHG® Rewards Club, the world’s first and largest hotel loyalty programme with more than 100 million enrolled members worldwide. This entry was posted in Corporate Travel, Hospitality, Hotels, Luxury, Rentals, Resorts, Tour Operators, Tourism, Travel, Travel Tips & Info, Travelers, Trips and tagged Chris Roberts, Holiday Inn Express, IHG, Karin Sheppard, McAuliffe Stevens, Preston Stevens, Pro Invest Group, Queenstown, Ron Barrott, TIA, Tourism Industry Aotearoa. Bookmark the permalink.